SIS LIVE provided 70 satellite uplink vehicles to the main UK broadcasters for their coverage of the UK General Election 2010 coverage. Uplink vehicles and SIS LIVE crew were deployed throughout England, Scotland, Wales and Northern Ireland, giving the broadcasters unprecedented coverage of the main electoral battlegrounds. The number of SIS LIVE’s customers represented the whole array of broadcasting companies, including the BBC, Sky News, ITV, ITN, Five News and GMTV, as well as STV in Scotland, RTE in Ireland, and Sky Italia. Many of these uplinks used SIS LIVE’s innovative uPod Micro portable uplink system. uPods were also supplied to GMTV and BBC Wales. 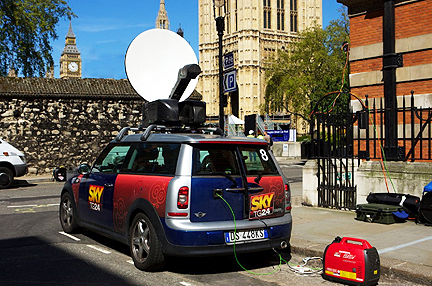 Sky Italia’s Mini Micro also transmitted LIVE news feeds to Italy. The Mini’s small ‘footprint’ made parking in a narrow side street easy and the fully automated uPod Micro satellite uplink allowed transmissions at the push of a button. Two SIS LIVE OB trucks and numerous uplink vehicles have been positioned outside Buckingham Palace ready to cover the new Prime Minster arriving to meet the Queen, whenever that may be!